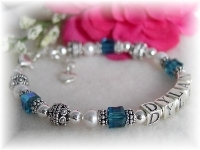 This beautiful bracelet is sure to please! Created with 6mm beads for girls or 8mm beads for teens/women ~ accented with your name in sterling silver letter blocks (up to 10 letters maximum). 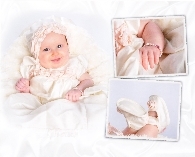 A beautiful keepsake that will surely be worn again and again. Many color options, including freshwater pearls, Swarovski crystals and pearls. 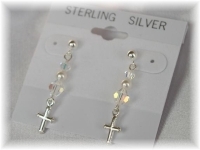 Sterling silver crucifix charm included. Price includes 6 letters. Additional letters $3.50 each. Due to CPSIA law, Swarovski crystal bracelets are not intended for use by girls under 13. An option is available for freshwater pearls (with the exception of a crystal "Our Father/Glory Be" and dangle "Our Father" bead only, which is less than 1 gram per CPSIA law). Teens (13+) and women's bracelets are created with Swarovski crystals and pearls. Swarovski�pearls�with crystal accents and a�beautiful sterling silver�CZ baguette cross pendant come together to create this adorable First Communion necklace. I bought this bracelet for my step-sister's daughter's Quinceniera and she loved it. Everyone wanted to know where I got it from since it was so beautiful. I even got the chance to order it in the perfect size to fit with no problems at all. This truly was a beautiful gift. We gave this beautiful personalized rosary bracelet to our niece as a First Communion gift and she absolutely loved it (as did everyone else)! This truly is the perfect gift to give for First Communion - we highly recommend it! We bought this beautiful little personalized rosary bracelet for our granddaughter's First Communion. It is more lovely than the picture shows, and she absolutely loved it!